"In everything give thanks: for this is the will of God in Christ Jesus concerning you.” -1 Thessalonians 5:18.I was introduced to the whole idea of Thanksgiving through a beautiful missionary family that came to live in my parents downstairs apartment in Ecuador. I was 16 at the time, and I clearly remember this couples’ warm invitation to join them on Thanksgiving Day. I especially remember the delicious meal they served us. We, of course, didn’t celebrate Thanksgiving Day in Ecuador, but I soon realized that the ideas behind Thanksgiving are universal. The Pilgrims were immigrants in a new country and had come to America because of religious persecution. In America, they found the freedom to live and to worship the way they wanted. They came with the hope of creating a new life, founded on godly principles. Later, when I came to live in the United States, I started thinking about the importance of Thanksgiving Day. Being an Ecuadorian immigrant helped me identify with the way the Pilgrims felt. Even though I didn’t come to America because of persecution, I strongly identified with the religious traditions and celebratory attitude of the Pilgrims at Thanksgiving. 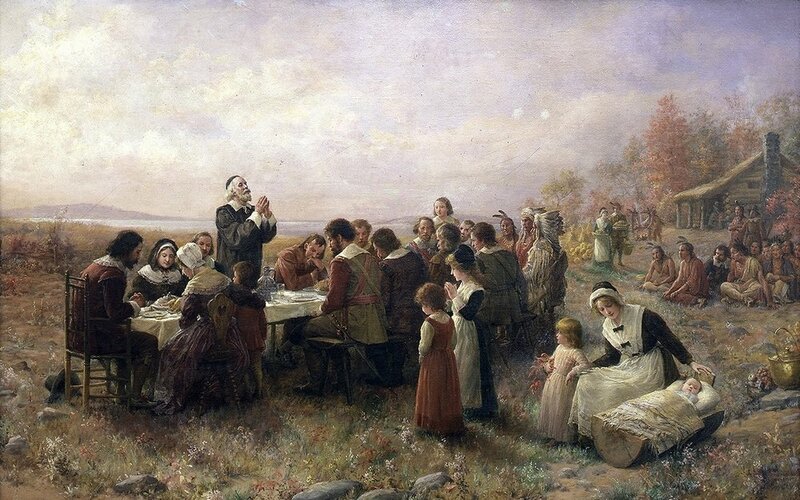 Edward Winslow, the third governor of Plymouth, expressed this same attitude of thanksgiving in his famous letter called Mourt’s Relation: “And God be praised, we had a good increase…. Our harvest being gotten in, our governor sent four men on fowling that so we might after a special manner rejoice together….” Winslow continues, “These things I thought good to let you understand… that you might on our behalf give God thanks who hath dealt so favourably with us.” I am so grateful to God for creating amazing people willing to follow Christ. People that don’t compromise with God’s principles and truth. Children of God that, no matter what the circumstances, are willing to stand firm in their faith in God. These are the people that encourage my walk with the Lord everyday! I thank God today for his loving children--the ones that will always follow him no matter what the circumstance. I thank God for the many Christian martyrs who don’t give up their faith. I am thankful to have a mighty, loving, and forgiving Heavenly Father that brought salvation to humanity through Jesus Christ. I am thankful for the Holy Spirit that comforts us through our trials and leads us to be lovers of Christ. I am thankful for my husband and children, my extended family, and my friends. Happy Thanksgiving!